Purchase a Midwest Nosecone to provide a good straight attachment for your Midwest Shorty or Midwest Rhino low speed motor. 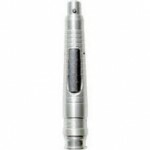 The Midwest nosecone is the preferred tool for doctors, clinicians, and lab technicians who prefer the 3/32" mandrels and doriot type nosecone heads with the extended shaft which allows handpiece head to be driven by the nosecone. Lots of variations available for this arrangement, manufactured by Midwest and others. Look for speed increasing and decreasing doriot heads to match required speed and torque for the given preparation. Also, remember that heads rated for higher speeds typically are made with more robust materials and, as a rule, will last longer, even in lower speed application.